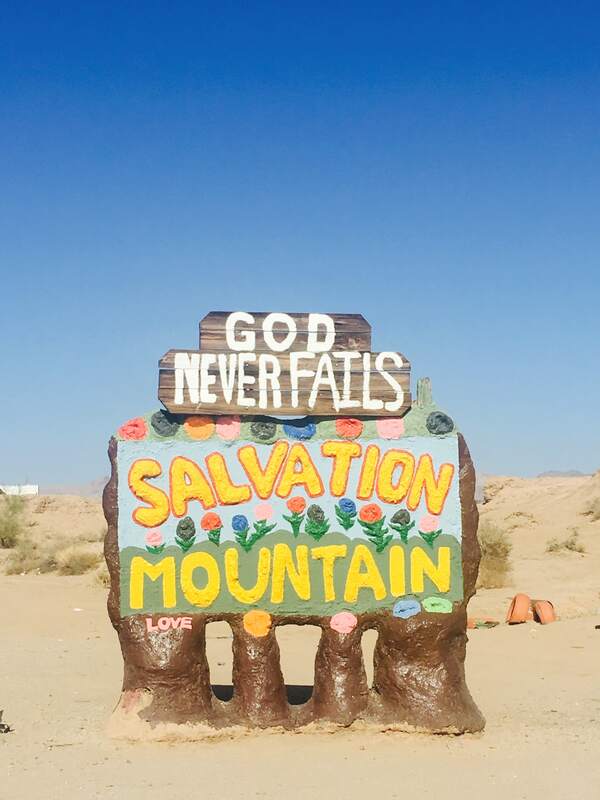 Nestled in the Mojave Desert between a WWII military training outpost and the Salton Sea is a place called Salvation Mountain. 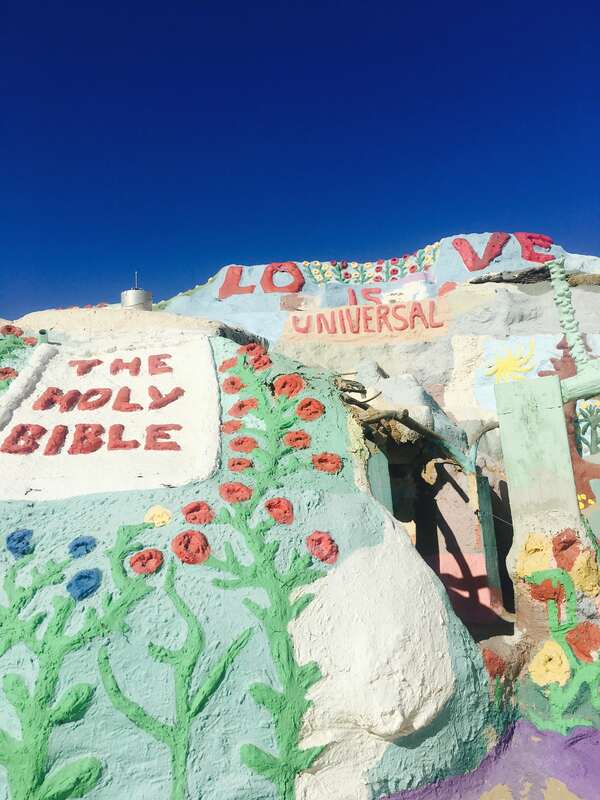 About a 3-hour drive from Los Angeles and an hour-and-a-half from Palm Springs, Salvation Mountain is a powerful spectacle of color and hope in the middle of the desert. 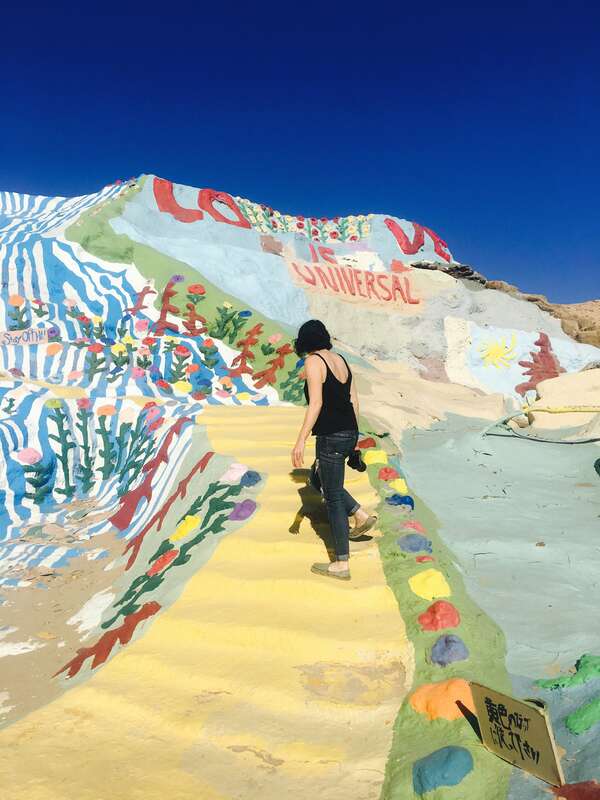 We took a road trip out to witness Salvation Mountain up close. As we entered the city of Niland, we were immediately struck by the desolation of the town. Broken down buildings, sprinkled with modular homes on tiny plots of land divided by chicken wire fences was all very Mad Max. 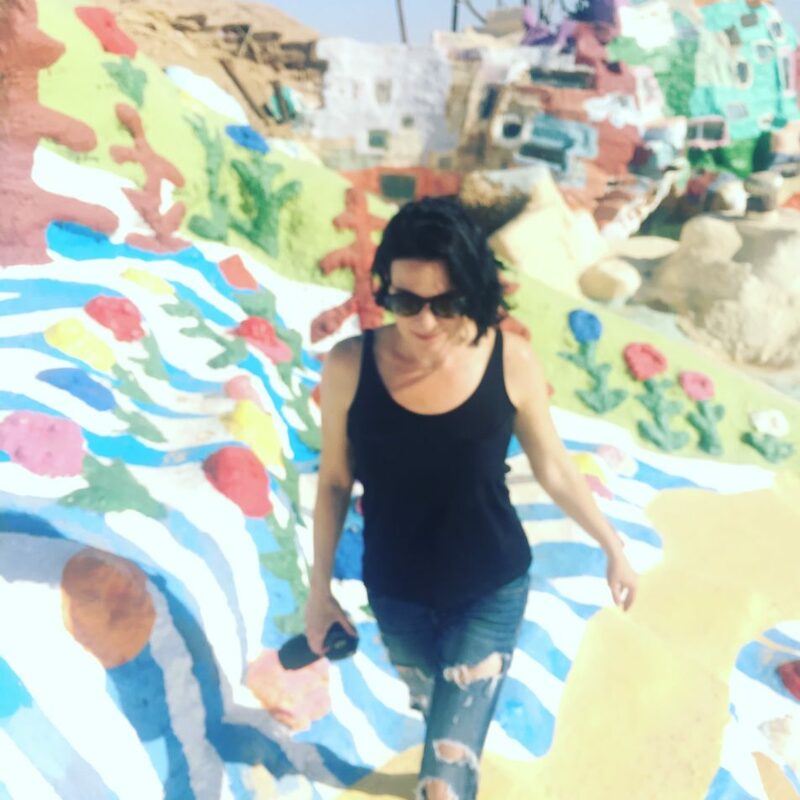 Despite Niland’s post-apocalyptic feel, we did not find Salvation Mountain unsafe and proceeded to get out and explore the climbable mountain and its adjoining museum. 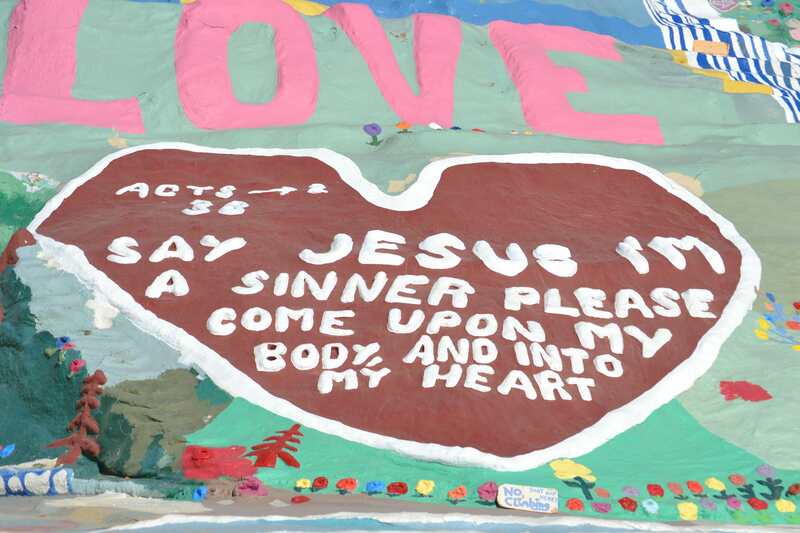 Salvation Mountain is an artist’s life’s work left behind as a powerful whimsical display of the message, God is Love. 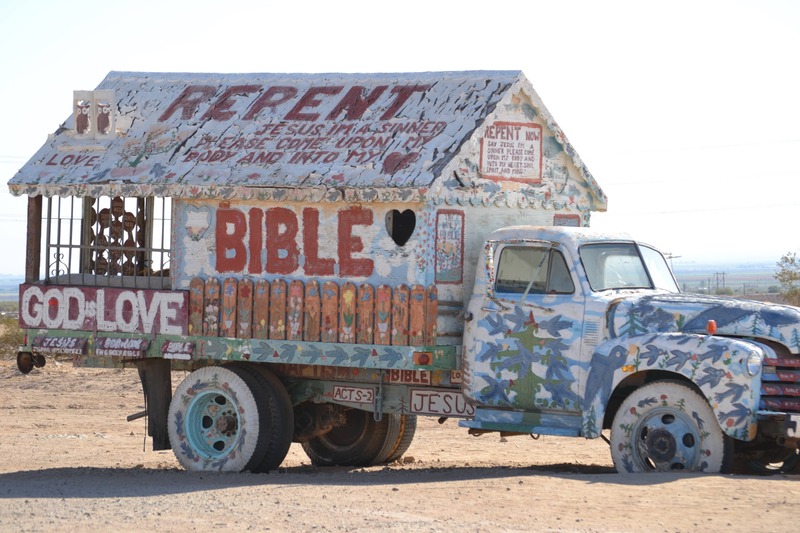 As I researched more about Leonard Knight, the artist behind Salvation Mountain, I was overcome with awe. Born in 1931 in Burlington, Vermont, Leonard came from humble beginnings and did not have much education. He was drafted in the Korean War but it ended 10 days into his service so he was honorably discharged. The story goes that Leonard was visiting his sister in San Diego who was always prattling on about Jesus and it irritated Leonard. One morning, he went to sit in his van to escape her preaching and for some unexplainable reason he asked Jesus to come into his heart and repented of his sins. From that day forward, his life radically changed. He was 35 years old. He went back to Vermont eager to share his story, but was unsuccessful in finding a platform for his “over-simplified” view of the gospel. He thought perhaps the best way to get his message across would be via hot air balloon instead of a church so he spent the next 14 years trying and failing to get his home-made hot air balloon to fly. In 1984, while working a job in Arizona changing tires on big rig trucks, Leonard took a trip to Niland, CA. The area alluded him so he decided to try his hand once more at his hot air balloon. It failed once again. As a result he made up his mind to stay one week and make a small statement before he left. With a half a bag of cement and some paint he erected a monument on the side of a forgotten riverbank. That week turned into years as he just kept piling on the paint and cement day after day until 4 years later, the mountain fell down. Instead of being discouraged, he thanked God for showing him the mountain wasn’t safe and vowed to start over again and build it smarter. 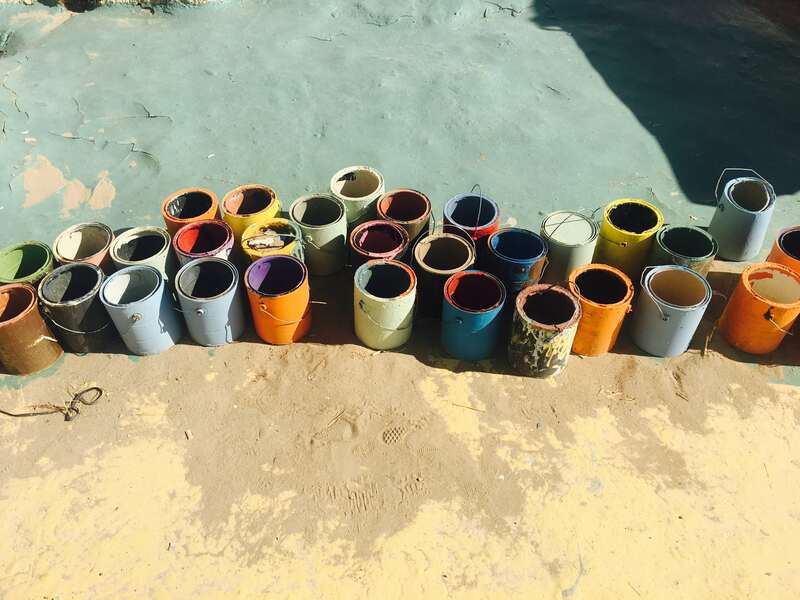 Over the next several years he rebuilt it using adobe mixed with straw and over 100,000 gallons of non-toxic donated paint. The final result includes the Sea of Galilee at the bottom, the heart of Jesus in the middle and the Cross of Calvary at the top. The rainbow colored museum to the right is a testament to his original hot air balloon. For 20 years Leonard lived out of his truck on $249/month social security and worked on his masterpiece. He died in 2014, having achieved his goal. It is fascinating to me that in this dystopian, no-man’s-land God is touching so many people through one man’s valiant effort to share the gospel message of love. Like flowers in the desert, hope springs up through this Dr. Seuss-esque installment punctuated with Biblical quotes throughout. Upon arrival, we were overcome by excitement as we entered the museum and the Hogan, a small living space constructed after a Navajo hut. You can get lost in the “trees” inside the museum built from straw to hold up the edifice. A sprinkling of scripture verses along the walls serve as inspirational décor. There are many signs throughout the structure reminding you to “stay on the yellow brick road” which essentially is a path painted yellow for easy navigation around the mountain and throughout the museum. Unfortunately, the volunteers tasked with preserving the artwork since the artist’s passing are not quite as committed as Leonard was to the message of “God is Love”. They can be very unkind if you do not obey the signs, so be sure to stay on the path and stay clear of anyone who decides to stray from the yellow brick road. True story. We were actually kicked off the mountain by one of the volunteers with a megaphone for being near a stranger who ventured off the yellow path. We were accused of “watching her break the rules” (guilt by association). It turned out to be a huge bummer for us that the volunteer did not handle things differently, given the artist’s message of love, but you can learn from our experience and hopefully have a much better time enjoying Leonard’s creation. 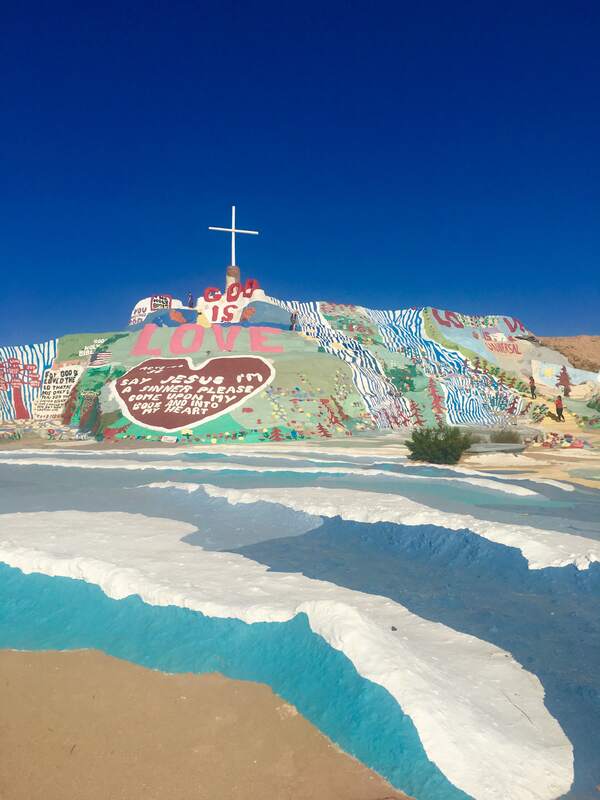 At first it seemed odd to me that a man would choose a desolate desert town to create his monument of love, but as I thought about it, I realized the place is be perfectly suited for his message. Our hearts can often become just like this desert place with boarded up, graffitied buildings and broken windows. Years of trying to do life our own way and dealing with betrayal and injustice can leave us beaten down and desperate for hope. 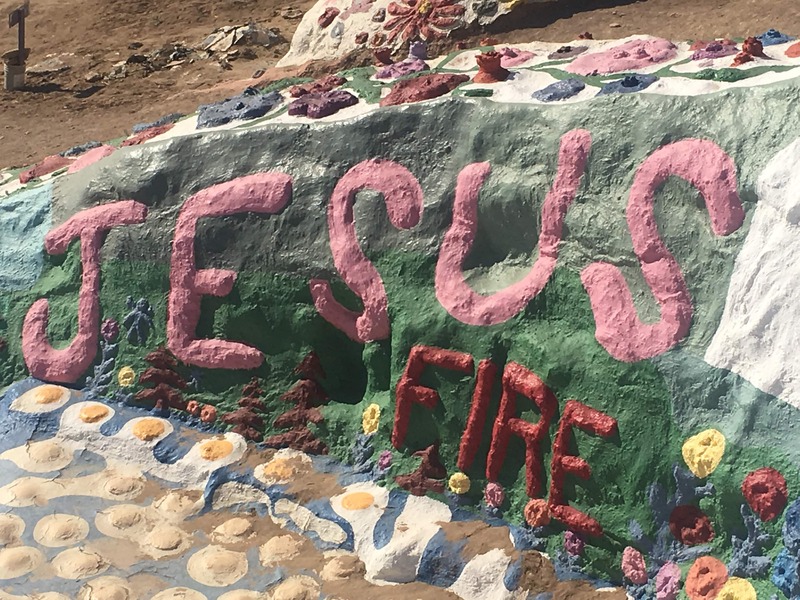 In the midst of a “lawless town” the message of Salvation Mountain is that we turn from the lawlessness we’ve become accustomed to. That we give the control of our lives over to our Creator and He will take our broken vessels and make them into symbols of beauty and hope for all to see. 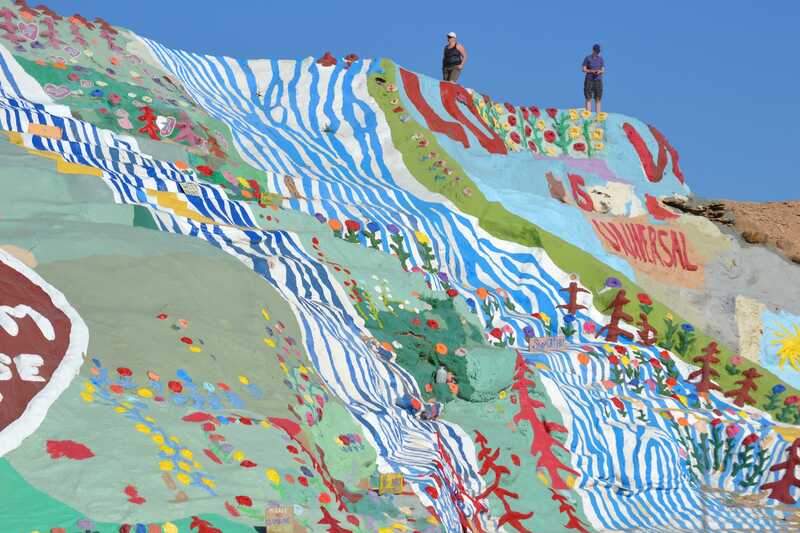 In 2002 Congress deemed Salvation Mountain a National Treasure and today thousands of people come to the middle of nowhere just to see it. 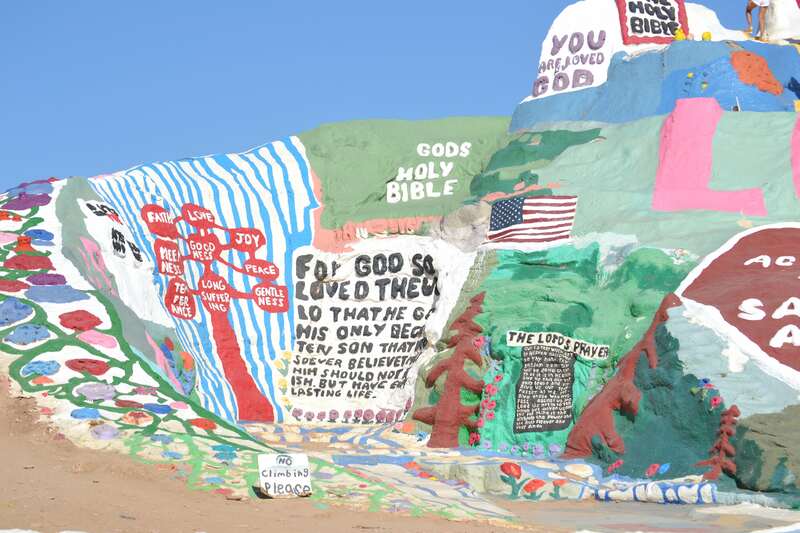 Here are a few tips to ensure a great visit to Salvation Mountain. Make sure you have a full tank of gas and plenty of water prior to heading out. Eat lunch beforehand, head to Palm Springs for dinner. 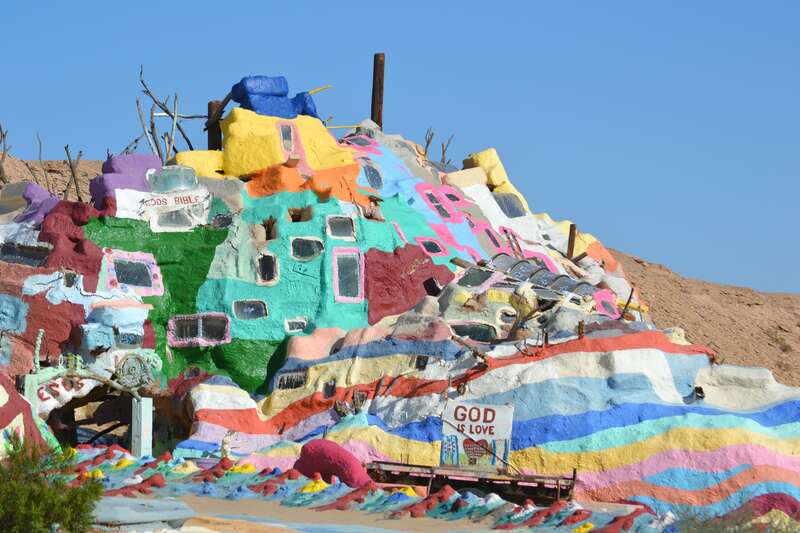 When touring Salvation Mountain, heed the signs at all times and stay on the yellow brick road. Go in the Spring or Winter to avoid soaring temperatures. Wear comfortable walking shoes with good tread to avoid slipping. Use Wayz GPS to get there, not Google Maps, otherwise you’ll get lost shortly after the Salton Sea. Thank you Brittany. Yes, I live in California, so this trip was much easier for me than those out of state. If you plan on a road trip out west, it is a unique stop to add.